I just had to share this. Last weekend I performed at 6 year old Dawson’s birthday party. His parents knocked it out of the park with some great birthday party ideas. First they chose a theme. In this case Harry Potter which with the release of Fantastic Beasts has enjoyed a nice resurgence. (PS I loved the movie). They bought the banners for each of the Hogwarts houses and the sorting hat on line. They used inexpensive Medieval decorations (these are easy to find during Halloween). Mom is obviously good at crafts. She made Harry potter style magic wands for each of the kids. Don’t have time for this, how about using Christmas icicles as magic wands? The real coup de gras were the scarves. Mom’s sister was a very special person. She not only took an interest in Dawson’s special day by taking photos and video, she actually took time to knit house scarves for each of the kids. This was huge. I’m not suggesting that everyone should take time to knit scarves but by allowing time to plan it gave everyone a chance to take part. (I was booked more then 2 months in advance, so I know there was some planning). Another idea don’t be afraid to ask. Most people love to help. It doesn’t need to be as big as knitting scarves but people love to help. It makes them feel a part of your special occasion. In conclusion have fun with your kids party! Take time to plan. Use your imagination and do not be afraid to ask for help. If you are looking for entertainment for your kids birthday Click Here Now. 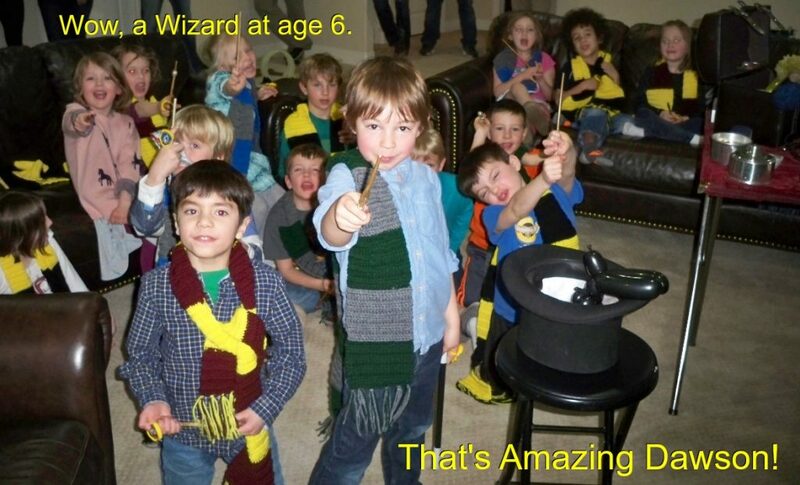 Not only do I provide a Harry Potter themed magic show I also have 3 affordable packages for almost any birthday party. You will find a list of prices and some interesting add on ideas to make your party more fun.